If you are Italian your parents may have or still do make Eggplant Meatballs also known as “Polpette di Melanzane) which are delicious on their own or dipped in a marinara sauce. Today I’m sharing my version of this classic Italian recipe but I actually have meat in my eggplant meatballs. If you don’t fancy the meat in my version don’t run away just yet as you can simply eliminate it. Combine all the other ingredients the same way adding breadcrumbs as needed until the mix comes together. If you eliminate the mince pork and beef you’ve made the Italian Polpette di Melanzane which is a great vegetarian dish. We were given eggplants from my wife’s parents who tend to have legions every gardening season because my father-in-law who is retired loves to grow just about anything in abundance. I think eggplant must grow like weeds because we end up with quite a few in our summer box from them every year. In the past I’ve made cheesy eggplant lasagna which is amazing as well we enjoy eggplant parmigiano but I wanted to try something different. I considered making eggplant parmigiano pizza which I saw on The Food Network but I wanted to try this eggplant meatball first. A friend of ours who is Italian makes eggplant meatballs the classic way which is where I first learned about these beauties. Since my wife and I love meatballs we decided to make our own version of Italian eggplant meatballs to add to our recipe box. In Italy eggplant is called a melanzane and in the UK it is called an aubergine which is what I am used to calling these gorgeous vegetables. The eggplant is “botanically classified as a berry” so it’s actually a fruit although we associate it as a vegetable. Apparently the eggplant is related to both the tomato and the potato. Other common names are melongene,garden egg or guinea squash. Eggplant are not always the first vegetable of choice for many but it is widely used all over the world especially in Italy, India, France, Middle East, Greece, South Africa and so on. You can roast eggplant, grill eggplant, stuff it and make dips like Baba Ganoush which is an Arabic levantine dish of cooked eggplant, onions, tomatoes and other seasonings. You may also see Baba Ganoush as a dip at your local grocery store which is great with tortillas, bread and all sorts of raw vegetables. The first thing I did was prep the eggplant which meant I peeled and cubed it. I put the eggplant cubes in a pot of salted water and boiled it until tender. I put the eggplant into the blender and added in some cumin, garlic, soy sauce, black pepper and processed it until smooth. You will want to chill it until cool so you can work with it. Once the eggplant mixture is cooled add the pork and beef, the eggs, pecorino romano cheese, breadcrumbs and all the seasonings and mix until it comes together. You may have to add breadcrumbs until you get the desired texture so you can roll them into balls. I used dry breadcrumbs but if you have 4-5 slices of dry day old white bread you can break this up and use it instead which is just as delicious. I didn’t at the time. Tip- One bit of advice I was given when working with mince is to test it before you roll it. What I do is make a couple of the eggplant meatballs and fry them up to taste for seasoning and adjust. The worst thing you can have is a bland eggplant meatball. Once I rolled the eggplant meatballs I chilled them to form on a baking sheet for about 45 minutes in the refrigerator. You will see once you deep-fry these eggplant meatballs in extra-virgin olive oil until golden brown how moist they are. I also made zucchini pasta with homemade sauce the next day and added a few of these eggplant meatballs on top. I could hardly wait before I stuffed a few in my mouth after a sprinkling of parmigiano-reggiano cheese. Delicious. 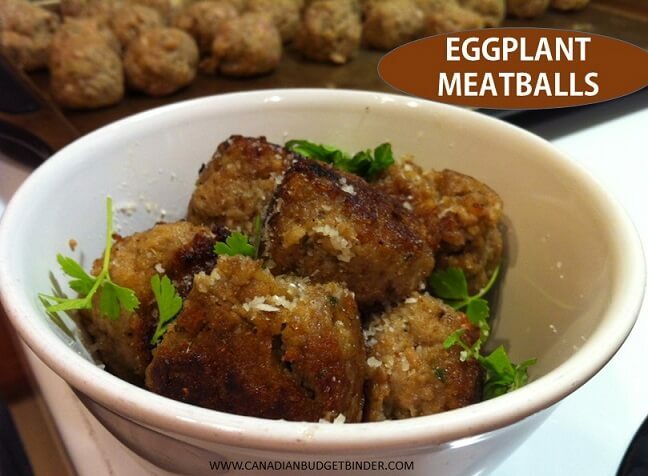 These would be great as a party meatball in place of the Italian meatball served with a side of marinara dipping sauce. People might not even know there is eggplant inside. Shh!! If you love meatballs and eggplants you will love them combined in this eggplant meatball recipe that I have for you today which is great dipped in homemade marinara sauce. In a large pot of salted cold water bring the cubed eggplant and garlic to a boil and cook until tender. Put the eggplant and garlic into a food processor with the soy sauce, cumin and pepper. Process until it forms a paste. Taste to make sure the seasoning is correct. Add more salt if needed. Let the eggplant mixture cool completely. In a large bowl add both the pork and beef, 2 eggs, breadcrumbs, salt, pepper, garlic, basil, parsley, pecorino and the cold eggplant mixture. Mix until completely combined. Make a couple of meatballs and fry them to test seasoning, adjust if needed depending on your taste buds. Set on paper towel to catch any excess grease and top with grated fresh parmigiano regianno cheese. Enjoy on their own or dipped in a homemade marinara sauce. You can freeze these eggplant meatballs up to 3 months. Yield may differ depending on how big you roll them. You can freeze the eggplant meatballs if you don’t want to use them all at once for up to 3 months in an air-tight freezer container. When you want to use them, defrost then fry them up. I’ve enjoyed these plain with the parmigiano-reggiano cheese on top or dipped in homemade marinara sauce. Thanks for the recipe!! I think I would use onion instead of all the garlic as that is a bit much for us here. The trick would be getting the eggplant past hubby but if I can get these made up without him knowing I can get some extra veg into that boy!! The boys will try anything you put in front of them and likely eat whether they like it or not. Hubby…not so much.